Resignation letter is essential for those who are going to left their previous job for any reason.As an employee of a company or organisation it is our responsibility to let your employer know when you want to quit your job. This resignation letter should have following parts viz You name, Your job tittle, date of resignation and the reason of resignation. Employees change jobs all the time and for different reasons. It's a part of life and as such, it's good to leave your job on a positive note. It can be difficult to do this sometimes, but if you leave on a positive note, your chances of acquiring future positions is increased. 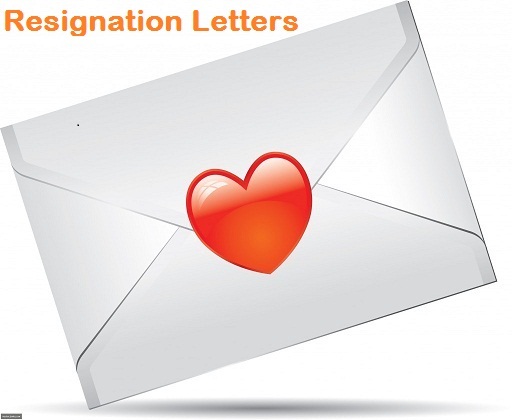 There are several things to keep in mind when you give a letter of resignation. First, give your employer plenty of notice to fill your vacancy. The general rule of thumb is to give at least two weeks notice. Always try to write the resign letter in a polite, it will create a good impression of you in the mind of Employer. Though it is always not necessary to write the detail reason for which you are going to terminate your job, but if possible, you should describe the details about the problems for which you are going to left the present job. Your reason should be brief and to the point. Depending upon the company, Job position, and type of the organisation, the resume letter also differ in style. So here i am going to provide you some resignation letter formats which will help you. you can also download these resignation letter from the below given links. today. My last day at (name of company) will be (date of resign). If you are going to Email your Resignation letter to your employer, then this format will be helpful to you. It is with deep regret that I give you my formal notice of resignation as [your title] at [company name]. My last working day will be [date]. position will challenge my growth and further my career. I appreciate the professional development and growth from [company name], and in particular from you. I wish you and [company name] continued growth and success in the future. format will be like this. you for the support and the opportunities that you have provided me during my tenure with [school name]. these skills will serve me well in my career.